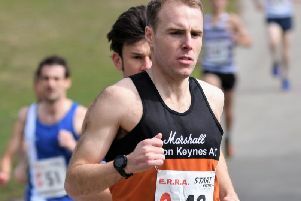 Sunny conditions were far from ideal for athletes, but MMKAC still boasted some impressive results across the MK Marathon events. MMKAC had 30 runners in the 2,000 strong field that competed in the Pocket Rocket 5km that opened the MK Marathon weekend. They had four in the top ten where Elliot Hind made a bold bid to win but in the end had to settle for second place with a time of 15.44. Wendy Webber was first lady and improved her course record to 18.12 and Montana Edgehill was third lady and first F20 Ross Wood placed 8th (16.40). Robert Hickman was close on Ross’ heels, a place down in 16.42 which gave him the M20 prize. Jeremy Vick closed in 10th (16.42). Leo Freeland was second M20, 16th overall in 17.11.Andrew Kirschner took 23rd position (17.39), Joshua Ustaran-Anderegg was 28th (17.48) with Eduardo Ustaran closing in 30th (17.50). Wendy Webber ran a PB 18.12 (38th overall) to move up two places in the club all-time rankings. Simon Kirschner-Heavens clocked 18.25 for 45th place and next home was Montana Edghill, 55th overall and first F20 in 18.41. Diane Baldwin was 2nd F55(20.49) with Debra Brent setting a PB as third F55 (21.55). From the field of over 3,000 in the half-marathon Dan Webber from MMKAC was the first local runner home in 8th position with a time of 79.50. From the club Matt Turner just made the top 100, 97th in 96.25. Stewart Fraser finished 27th in the M50 category recording 110.21 with Steve Martin just inside 2hours, 87th overall (117.36). Vicky Kirschner-Heavens placed 714th(120.15) and Mel Wright 988th (126.05), both in the top third of the field. Just over 2000 finished the full marathon and saw Simon Kirschner-Heavens record 3:34.31 to place 146th. Paul Sutherland was the 3hour 50mins pacer and comfortably run round in 3:48.23. Neil Jones struggled somewhat in the heat to finish 317th with a time of 3:54.39.